Be sure to get on the same page with the people around you when you do it! I actually still live at home with my parents right now, so they also seem to have no idea why I’ve gotten on this kick. I explained to them my need to pare down my things so that I can more easily move out and give them more room for the things that they seem to accumulate (and never toss!). I also explained that it could help prepare for my younger brother coming home from college next year and having to move in if he needed to. My fiancee (who lives elsewhere)was very happy when I mentioned I would be bringing less stuff into her already crowded apartment. 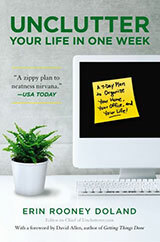 This goes hand in hand with the article’s note about doing organizing at your office. I think if folks in the office knew that you were doing this to say, help streamline your mail processing, they might not might seeing you with the phone off the hook for a few hours from 9-5. My “to-do” list grows as I work on our home office. I am so close to the positive result I want but there are 100 details that need to happen before I’m finished. Each is a welcome step in the process because for so long I was stuck and didn’t know what to do next. So true about the extra runs to charity. For me it is helpful to remove even one box from the house as soon as possible, freeing me to “see” the next step more clearly. I attach them to my regular errands. Yes, all of this takes up quite a bit of time and adds to stress, but it will be so worth the effort. Having a neat workspace is one of the criteria on our annual evaluations. We have managers whose desks are so bad that paperwork is literally lost in the piles, which has resulted in important documents not being approved and returned, accusations of reports never being received, etc. I can’t imagine why one might get dirty looks for organizing their workspace. The employees around here who organize their work are more efficient and effective. There are definitely a lot of repercussions, but all in all, the positive benefits outweigh the bad by a cosmic mile. Yes, Mellie, I agree. The project I’m working on — moving into a new house while paring down my things and disposing of my husband’s belongings (he died shortly before the house was finished) is pretty bid. Rather than waiting to get rid of trash, recyclables and donations at the end, I’ve made a run almost every day to the dump/recycling center and/or the donation center. That way I’m seeing the mass of boxes decrease, one by one, and it feels like progress. Yes, Joe, great point about getting the other people involved on the same page. If I may, as a person much older/more experienced than you in the process of melding households, I’d like to offer some unsolicited advice about your move: It’s really hard to combine households at the best of times. If you just arrive at your fiance’s place with a couple boxes and the place is already packed with her stuff, that could cause issues. She’s got all the territory already staked out, there’s nowhere that belongs to “you”, and you’re essentially a visitor in what should be your own home. A couple thoughts: Any way to get her to buy into decluttering her place prior to your move in? You might check the archives for posts on packrats and unclutterers sharing the same homes. It’s a challenge. All the best to you! I couldn’t agree with you more! I have a near- minimalist workspace now. Some of my colleagues think I’m leaving, that I have “lost it” and ask me if I’m alright. I am much more productive since I have de-cluttered my cubicle and actually enjoy coming to work now. The growing to-do list is me all the way. When I find my list growing out of control, I give myself permission to delete anything that is low priority. If something has been on my list for 6 months, I know it will probably never happen. I do keep a separate “Maybe/someday” list for things I can’t delete completely. A note about dust inhalation and surgical masks: while they probably provide some protection against dust, most regular surgical masks (like the one you linked to on Amazon) are NOT designed to filter dust, dander, viruses, or other particles; they’re designed to prevent droplets of saliva and mucus from leaving a healthcare provider’s mouth and nose and landing on a patient, and to prevent splatters of patient blood and fluids from landing in a surgeon’s mouth and nose. If you’re serious about avoiding inhalation of dust and dander because of severe allergies, or if you’re working in a storage area where rodents and birds have defecated (zoonotic diseases such as hanta virus and psittacosis/chlamydiosis may be a risk), you need a NIOSH-tested N95 respirator. Some surgical masks are also N95 respirators, but not all. It will be printed clearly on the package. Just search Amazon for “N95 respirator” and choose a style and size that looks comfortable to you. You can also find N95 dust masks at home improvement stores, but they are usually a larger one-size-fits-all that fits most men but not most women. Thanks so much for looking at the downside of decluttering. A while ago, I realized that one reason that I find decluttering so hard is that my hands become tremendously itchy when exposed to dust. To get rid of the itchiness, I wash my hands often while decluttering. But then my skin becomes dry and cracked, even if I use hand lotion. I’ve tried wearing gloves, but I find that it’s too hard to pick up things with gloved hands. Again, thanks for acknowledging this problem! Allergies have been the most difficult part for me, my family is just thrilled to see me finally organizing and reducing the amount of stuff I own. But allergy pills and opening up the windows to let the air clear a bit has helped. But at least I know that it will be easier to keep the place dust free when I am done. There have been a lot of trips to goodwill and the library bookstore, it does add another errand to my schedule, but I find parting with my things liberating enough that the feeling from that outweighs the stress of driving there. Plus, I am glad to get my things back where they can actually be used. For me the hardest side effect has been thinking I have made progress and then finding more boxes of things stored away. @Kris I have the same exact problem. I am always taking breaks to wash of my hands and arms because at least the cold water makes the itching less. And I hate the feeling of lotion on my hands, so it is hard to use that enough to make the dryness less problematic. I have yet to find any solution that works. I don’t have too many issues when I work alone, but when I try to work with the love of my life, he gets frustrated. That’s probably my most difficult and sensitive issue when we declutter and organize together. @Kris and ValH — Have you tried the latex or powder free gloves like a surgeon or dentist might wear? #Erin, I have not, but I see it being worth trying. The difficulty with using those plasic cleaning gloves is that you can’t really feel that much through them. But those latex like gloves would be better for that. I was also going to suggest latex gloves — I find certain things gross (touching raw meat, cleaning the bathroom), so I started buying the box of 50 or 100 gloves at walmart or costco and I wear those when I am doing anything that I find disgusting or messy. My problem with decluttering — not having anywhere to get rid of stuff that isn’t trash. The nearest place to donate is 30 miles away, with limited hours and occasionally they switch to drop off by appointment only. And if the boxes stay in the house, they invariably get dumped out again, so it is difficult to just store them for a convenient time. Of course, if things weren’t in such a piled up mess downstairs, I could find a place there. Sigh. Freecycle doesn’t work for me because I am in a rural area so there are few members, and with one exception, the only people who have ever replied to me have said, Sure I’ll take it, when can you drop it off? — and since I live 15 miles from my town and the freecycle group covers towns up to 100 miles away, you can imagine how helpful I found it. Added to the lack of convenient donation spot is my nagging feeling that I should be HAVING A GARAGE SALE because I could probably GET A DOLLAR FOR IT. I am starting to get over that, since realistically, having a garage sale would mean hauling everything to either a community garage sale in town or someone else’s house and then sitting there for a day or two with my three, soon to be four, little children running around, and I just can’t see doing it. The other thing that I think is a problem is that I don’t have anyone to watch the kids for me when I try to clean. I only think it is a problem, because I’ve never actually tried a major clean-up or decluttering without kids around, and maybe it wouldn’t make any difference. However, my husband will not watch the kids. I think he thinks he does, but what happens is he sits in front of the TV and after I yell at them 4 or 5 times to get out of whatever I am doing and go see their dad, he will yell at them to go to him. However, he doesn’t actually come and get them, and he doesn’t actually do anything to keep them from coming back if they do go to him for a bit. Grrr. We have a company, and I had to prepare year end stuff for our accountant. It was MONTHS overdue. I had to go through a bunch of stuff to find all the paperwork and receipts, which took me forever. However, once I had all the paper, it was a day of work — just one day — to sort through it all and get it ready. After MONTHS of nagging me about getting it done, my husband’s contribution was just what I said — he sat in front of the TV and every once in a while would tell the kids to go to him and quit bugging me. And after a couple hours of that, he took off to visit the neighbours. And he DID NOT take the kids with him. And these are neighbours who LIKE having the kids visit. I don’t have any close friends around here of the drop-your-kids-off-at-my-house sort, and the only relative I have nearby who does free babysitting is my mom, but she is usually not available. For the past couple years, she has had a huge time committment caring for an elderly relative. For a while, it looked as if arrangements had been made that mostly freed her up, and she said she would come one day a week and help me with the house. I told her that if she would just watch the kids, I could get a lot done. She said okay, but there never came a day when she actually offered to take the kids. And since then, there have been other problems with the relative so her time is booked up again. Oh well, poor poor pitiful me. I realize I have it easier than many many other people. I think I just get kind of beat down by the constant mess, and I harbour a certain amount of jealousy of how everyone else (it seems) can drop their kids off at their mom’s or neighbour’s or sibling’s or make their husband take them whenever they need to get something done. I’ve got nasty dust allergies (like knock me out for the rest of the day, major respiratory issues type), so I keep a box of dust masks and a box of latex gloves around for cleaning. Once I got diagnosed, we moved to a new place with all hardwood floors and started running the Roomba ever day when I leave for work; now the attacks during decluttering and big cleaning projects isn’t as bad since I’m not exposed to quite as much on a day-to-day basis. If all else fails, you can also chore-swap with your significant other, your roommate, or a friend. I frequently make bargains like “If you clean the air vents while I’m out, I’ll clean the toilet and the bathroom floor when I get back.” (At least I don’t have too much of a mold allergy!) It usually works pretty well, and it works even better if I throw in a bribe with beer on top of the chore swap. Not everything can be avoided, but if you have a bad dust allergy you should really get somebody else to vacuum, dust, and pull stuff out of storage for you. If you’re willing to do some of the grosser or more annoying household tasks in return (bathroom cleaning, dealing with drains or gutters, detailed window-washing), you can probably find somebody who will help you out. My biggest challenge has always come from actually removing items from the house after the decluttering. Too often I’d put items in a temporary location, a way station, that over time would become just another permanent location. I was recluttering, not decluttering. So now I approach decluttering in reverse by trying to anticipate what I’ll need to get clutter out of the house. I’ll set aside a place in the garage so I can easily move things to the car or the curb. Get trash bags or boxes for donations and shipping. Keep my camera at the ready for Craigslist and eBay postings. Then I start decluttering. It’s not fool-proof, but it helps. I just did a major decluttering project on my bedroom, including a zillion new book cases, moving nearly everything, and repainting. Between all the dust stirred up, and really pushing myself to finish the painting (by not sleeping enough), I got a nasty round of bronchitis. The moral of the story is, declutter with dust masks, and take good care of yourself! I came across one of those emotional landmines myself while decluttering my office desk the other day. I’m still a little upset by it, but I’m also very happy that it’s finally shredded, and won’t come back to distress me in the future. I try to build some space into my “immediate” to-do list to accommodate those little add-on tasks. However, I also try not to get distracted by them. If something wasn’t an issue before I noticed it, it’s not an issue now. It can go on the grand-master to-do list, but it doesn’t get “do it now” status. 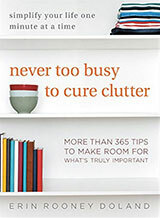 Anyone else with this problem: Decluttering causes a MESS! I have all my junk “neatly” packed away (or it at least feels neat since I can’t see it). I decide it’s time to go through it, haul it all out, get half way done… and I’m left with a junk explosion that I’m too tired to deal with the rest of. Last night I decided to declutter my closet. Great! Hauled everything out, already have about 6 bags to take to the Goodwill… and I’m currently on my computer to avoid the hurricane that has swept through my apartment. I can START, I just can’t finish. It always seems to get worse before it gets better. Victoria, you’re right, it does get worse before it gets better. I have to force myself to put back what I don’t have time to address or it gets very discouraging. If I’m overwhelmed with unfinished projects, I may fear that an uncluttering effort will turn into another unfinished project added to the list. Also, when I’m working on uncluttering in an area where other people have left their things, I can start harboring evil thoughts about my loved ones. I can totally relate to the dust and the never-ending to-do list! I guess that is just life, but its so frustrating – the repetition of it all. When I unclutter, I have to deal with all the things that need to leave the house and then have them in my car until I can get to that particular errand. Luckily, these massive jobs don’t happen too often, and I try to just accept the mini-messes that happen with regular uncluttering. Its a process! One of my permanent solutions is just to try and buy less stuff. But even when I buy groceries or other necessities, there is temporary clutter in putting everything away, repackaging bulk items, and getting all the canvas bags down to my car again! Thanks for the words of wisdom. I should mention, though, that my fiancée isn’t totally a pack rat or anything. In fact, she’s left one of the closets open for me, which should be plenty of room for my clothes! The only furniture I would add would be a desk, which might make for a tight squeeze, but we’ve resolved to cut down on our respective book collections and get one or two large bookshelves to fit them all on rather than using the ones she has spread out all over that we accumulated through college. All of the above, though thank goodness my allergies aren’t bad. The best way I’ve found to deal with the aftershocks of decluttering is to not take on too much at once. And by that I mean literally taking just one carton of files, one drawer from the closet, or one shelf of the bookcase at a time. Because once you empty something out to work on it, you have a mess, and there is only so much time and energy to get through the task and tidy it all away again. Better to take small bites than to get overwhelmed, frustrated, and discouraged. This also helps the others living in the household to live with/through the process since they may get a bit threatened, resistant, and defensive if too much changes at once. A daft repercusiion, but in my new area we got lots of plastic sacks delivered, asking for people to put out donations for charity (clothes, bric a brac etc.) – now I have nothing to put in them ! Where were these guys in my old area? I’m bumping into several of the downsides on Erin’s list. The trips to Goodwill aren’t bad, as there’s one near my grocery store, but I need to schedule an appointment at the county recycling center in order to drop off hazardous waste (6 or 7 old cans of certain kinds of paint, shellac, and stuff like that). That’s a hassle. And I’ve run into some “emotional landmines,” as someone called them. The whole process is slow, and mentally & physically tiring. That was supposed to be “…trying to get my house ready to sell.” No Edit button here, darn it all. I’m quite sensitive to dust and use the HobbyAir forced air respirator http://www.axispro.com/index.php?categoryID=2. It’s designed to supply clean air when spray painting with toxic paints. It has an air intake pump connected to your mask by 40 to 80 ft of hose. You put the intake box outside or in a window and breathe the air from there not whatever air you are working in. It is expensive. It’s another thing to store and it requires periodic replacement filters (for the air intake to protect the motor) but it works. I live alone and at times it is the only way I can make progress cleaning. The problem I’m running into is everyone wanting to fill up and take advantage of the clutter free space I’ve created in my garage to store their stuff. Any ideas on how to say “no” and also to please get your stuff out of my garage without losing friends? I’ve been drafting up a post about going paperless/ minimalist in my office, and this feeds right into one of the concerns I’ll be expressing in it — that a professor isn’t *supposed* to have a bare desk and shelves! Visitors expect to see a stereotypical professor’s office stuffed from floor to ceiling with dusty books and columns of paper. I’m afraid that as I empty my filing cabinets and bookshelves in favor of PDFs and e-books, I may be inadvertently presenting myself as less “scholarly” than my paper-loving colleagues…. My biggest problem is being so successful about my own decluttering and then not having the same level of enthusiasm from the real packrat in the house. When he does look at a box, he’s actually very good about clearing it out. I wonder if there is something that would really motivate him so I’m not just the constant nagger…. @Jess I’m always motivated by media. What about for every box or two/three/five he goes through, you download a favorite song, movie or book (all electronic of course, no need to add to the clutter). Thanks for the tip, @GregK. My allergies aren’t that bad every time I clean, but it reminds me of the Storm Trooper helmet positive pressure respirator I got to use at a previous job when working around some truly harmful sources of airborne particles. It had a battery-powered internal fan that forced clean air in through filters, and the fan felt nice in the summer. They’re somewhat less expensive than yours, and smaller, but you’re right, it is one more thing to store and maintain. Luckily, I can usually get away with an antihistamine and a good dust mask, and just plan to go to bed early when the medicine makes me drowsy. @ Dru, maybe you should keep a very nice set of scholarly journals lined up on some shelves, perhaps with a leather-bound volume displayed on one of those stands, looking restrained-yet-scholarly. I think minimal is increasingly ‘in’, though, so I wouldn’t worry too much! Regarding the downsides, totally relating to the dust one – my poor housekeeping comes back to bite me every time! And occasionally, I do throw out things I wish I’d kept – like items that would have been good for fancy dress, or various books or other odd things. @ Dru – I’d move out the bookshelves and hang a big painting of a full bookshelf. There are some fabulous ones on etsy.com right now. Or get a false front mini bar that looks like a set of encyclopedias…. I’ll add “Listening to your pack rat friends throw hissy fits about how you are throwing away your inheritance.” to the list of repercussions. I’m weary of repeating “No, I don’t want it. No, I won’t miss it. No, I don’t need it.” I’ve lived the first half of my life without all of my grandmother’s things. I’m pretty sure I can manage the second half without them, too. @TMichelle – if I was going to be that directly reward-oriented, I know EXACTLY what would motivate him 🙂 I would just need to figure out my going rate! I was trying to think of something bigger picture that would be its own reward for him, but that might be too ambitious. I made a decision to declutter my bedroom first which includes my home office. I was doing great, taking a few saturdays off to dedicate myself to sorting and organizing my own stuff. My 4 yr old grandson was actually quite helpful throwing things away or placing things in the right box. We even had fun sorting socks. Then my daughter got involved. She offered her help to lift and move boxes and assist in decisions about old clothes. Great, I thought, I will get this whole room finished in no time. THEN she left my room and started cleaning out the hall closet!!! What the heck? I had a room full of boxes and a closet that was beckoning me to finish when she started hauling in the other stuff that she thought needed to be in my room!! I had to think fast ’cause I didn’t want to discourage her. I calmly asked her to help finish my closet then I would decide what to do with the other closet. It wasn’t so much the stuff as it was making more decisions of what to save, pitch, or donate. I was running low on decision making energy. @Victoria – Decluttering causes a MESS! SOOO true! It’s what makes getting started hard – where are you supposed to put your stuff while you sort thru it? Once, when I moved in with someone and we both needed to do a lot of sorting, we agreed to leave the small bedroom empty (which meant stuffing our desks into our bedrooms) so we’d have staging space. It was such a luxury! Another downside, if you live with someone: resentment. It’s not inevitable, thankfully. But the declutter could resent the other for not doing it, or for relying on the declutter for doing it, or for occupying the space ze just decluttered. The other could resent the declutter for changing things, or getting rid of the “wrong” stuff, or perhaps even for making the other feel guilty about not decluttering. I have allergies, asthma, pets AND a farm. My allergy/asthma specialist says that you should take a the over-the-counter antihistamine (such as Claritin/loratidine) 30 to 60 minutes BEFORE starting tasks that might cause you problems. Then the medication helps you avoid the allergic reaction, not just try to do a quick fix once a problem has started. It is both more effective and safer especially if you have asthma. The dust masks are a good idea too, but I have problems breathing that “warmed” (used) air if it isn’t cold winter air. @Tracy, that’s an excellent point. Taking the medicine beforehand as prevention also allows you to take a milder, less drowsy antihistamine, rather than having to take something stronger to counteract a reaction that’s already started. I do the same before I visit friends who have cats, so I can play with their pets without getting itchy. Another repercussion is that someone with grown children may find out that the young adults are not interested in the things that you carefully stored all these years, expecting to pass them on. They may only be interested in USEFUL things and/or things that they REMEMBER fondly. This is another reason to keep things only if you are going to use them. If the kids have never experienced the item, have no fond memories of its place at the dining table, they would be much less likely to want it. Although I am always partial to introspection, I found decluttering induced a certain amount of unintentional self examination. It isn’t necessarily bad, but having a pristine room and office with little else in it also means there are significantly fewer distractions. Ultimately I think it a good thing, but one the unwitting declutterer ought to prepare for. the space it takes to pull everything out of a closet or attic and actually go through it, and once its out and your sorting it, there is more space needed for the sorted items to live until you put them away or donate them or find them homes. Also asking a friend for help ultimately leads them to find interest in some of the stuff and make me second guess myself for getting rid of it. decluttering never happens in one day for me and living with the mess it creates can be VERY stressful. I can’t say it’s resulting from decluttering or organizing, but one of the biggest issues I’ve found is – if I’m not involved, things get moved around and I have no idea where they are. Worse is if things are just moved or re-arranged, often stuff is put places just because it fits, and is no where near the items it’s used with are. I now have about 4 places to look for my gardening things, should I decide to try to find them. Much easier to just buy new. Also, finishing the task is often tough for me. I get started decluttering, and then…..the effort fizzles out. Sometimes it’s due to indecision (“I know I don’t use this, but…”), sometimes due to perfectionism (waiting for the perfect storage item), sometimes due to fear of getting rid of the wrong things (“the last time I threw out those boxes, I needed one the next week”). Sometimes, while decluttering, the realization of how much money I’d spent on some of it is rather depressing, and I quit. About 10 years ago, I would have said trying to declutter with the Dear Sweet Child around. He had a major case of “oooh can I have that?”. Fortunately now at 15, he has no interest in my decluttering, and does well at decluttering his own things about 2 times a year. Still, I keep making taking a whack at the job every few weeks. A few items out are better than no items. @jdbeany: Ditto about the packrat friends who are worried that one will be tossing a treasure. And yet, they usually don’t want it either if you offer. They have enough junk of their own. Also the friends who suggest that you should try to “sell it on ebay/craigslist/at a garage sale” and make some money. Thanks, but I’ve already given this stuff enough of my time and energy, I just want it gone. I’m happy to let Goodwill or whomever get the financial benefits; I want the clear space. Yeah I would love to make money off of some of my better items I am chucking but ebay, etc was fun the first few times, then it’s work. I don’t want to hold onto anything I already decided to get rid of, because I would change my mind. I have to get it out of sight and in the trunk or garbage or call the recipient of the gift asap. Besides I feel the universe will balance everything out for my needs if I give to charity or someone who needs it. I find the toughest thing about uncluttering is that, the more you do, the more you find you *have* to do! Sometimes clutter doesn’t look like clutter until other things have been taken away, and you can see it more clearly. Then you look at an object and say, why is this thing hanging around? So I try to look at uncluttering as an archeological dig — you don’t uncover a site all at once; you slowly process the layers, one beneath the other, until there’s no more to be found. And assume that this process will take longer than you ever expected! @Treespeed: I used to have a problem with relatives giving me stuff to “keep” for them whilst they pursued (for example) a move across the country with only the stuff they could fit into their truck so “could I please keep this and this and this” for them…..that was years ago and eventually when we moved I contacted that relative and asked them to come and get their stuff. Surprise surprise they replied, “thanks but you can pitch it — I don’t want it/can’t get it here/don’t want to pay to store it etc.,” — okay. After that experience, and after seeing how much stuff my parents (one of whom has now passed) kept from THEIR parents and from their lives (and have consequently moved from house to house to house over a period of 50 years) I now have made it clear (on several occasions and it is working) in very matter of fact, but nice, ways, that I don’t have the space to keep things for people — that if they really want to keep something they might consider a self-storage option. I also suggest they “do the math” on what that will cost them over time and to ask themselves if it is worth keeping/paying for like that (just can’t help myself)…but the MOST effective thing I have done is let them know (again, not in a mean haughty way,but in a firm, “I am SO not kidding” way) that if something/anything is in MY house or garage, it is now MINE to disposition. Meaning….if you leave it here, I am not keeping it FOR you – you’re GIVING IT TO ME…and (brace yerself), I *will* almost certainly, sell it (and keep the money), or give it away, or throw it out, depending on what it is. They know I mean it because they’ve seen what I’ve gotten rid of that my husband and I have dispositioned of our own. They know I mean it because when I tell them this sort of thing, I do have (purposely) a bit of a crazy gleam in my eye. I tell them that I LIKE CLEAR SPACES, and they know when they’re over at my house and they decide to just dump their stuff willy-nilly on kitchen counters and surfaces, more often that not (okay, ALL the time) they’ll find I’ve picked it up and moved it somewhere into a neat little pile so I can work in my kitchen effectively, or place the food on the coffee table in a nice design with the flower vase and the napkins without everything butting up against whatever they plopped on the coffee table when they first walked in. So they think I’m a bit nuts. That’s okay. It’s workin’ for me! “I’m sorry, but that’s not possible,” is going to become a new part of my vocab. @WilliamB: Yes, you hit the nail on the head regarding the possibility of resentment. Am I the only one who things a downside of decluttering is regret? I’ve gotten rid of things, thinking it was for the best (never will use it; it’s been sitting around for far too long; etc), but then later regretting it because I realized it actually *was* important to me (sentimental item), I discovered a need/use for it, or someone I know could have legitimately used it. And for the things I don’t care to have back, I wished that at the very least I would have known to photograph them and make a list of what I got rid of so that in the future, I don’t go crazy looking for something I got rid of. My mind gets so entrenched in the decluttering mode that I don’t think of these things until way too late. Also, arnica cream works well if you bruise easily like some people who can’t not run into things or smash their shins on open doors. Not a klutz, just a declutterer! I like Alix’s ‘archeological dig!’ & like JustGail, I often find my energy fizzles before the project is over! As a kid, I’d clear my bedroom out into the hallway – then . . . . but would have to get it back in my room before my dad got home from work! Now I try to do ‘bite size’ pieces, & not get ahead of myself! A timer works well – I like some of the ideas on ‘fly-lady’ – set the timer in 15 minute increments, & give yourself breaks ~ every hour; only get out what you can put away in the time frame . . .